As the United States approached a budget crisis that will shut down many federal services and affect more than 700,000 workers, other countries looked on with a mixture of puzzlement and dread. For most of the world, a government shutdown is very bad news - the result of revolution, invasion or disaster. Even in the middle of its ongoing civil war, the Syrian government has continued to pay its bills and workers' wages. That leaders of one of the most powerful nations on earth willingly provoked a crisis that suspends public services and decreases economic growth is astonishing to many. American policymakers "are facing the unthinkable prospect of shutting down the government as they squabble over the inconsequential accomplishment of a 10-week funding extension", Mexico's The News wrote in an editorial. 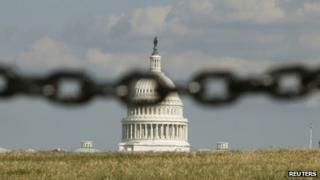 In the United States, however, government shutdowns - or the threat thereof - have become an accepted negotiating tactic, thanks to the quirks of the American federal system, which allows different branches of government to be controlled by different parties. It was a structure devised by the nation's founders to encourage compromise and deliberation, but lately has had just the opposite effect. Elsewhere in the world, such shutdowns are practically impossible. The parliamentary system used by most European democracies ensures that the executive and legislature are controlled by the same party or coalition. Conceivably, a parliament could refuse to pass a budget proposed by the prime minister, but such an action would likely trigger a failure of the government and a new election - witness the current situation in the Netherlands, where Prime Minister Mark Rutte's government faced a no-confidence vote at the start of debate over his 2014 budget proposal. And even when there is a gap prior to a new government taking office, national services continue to operate. In non-parliamentary democracies, such as Brazil, a strong executive branch has the ability to keep the lights on during a budget impasse. Such was the case in the United States as well, until a 1980 Carter administration interpretation of the 1884 Anti-Deficiency Act strictly limited the powers of federal agencies in the absence of congressional funding authorisations. Now, as the latest shutdown crisis plays out, policymakers in other nations are left to ponder the worldwide impact of the impasse. "Globalisation … means every country is in it together," writes David Blanchflower in the Independent in the UK. "Americans sneeze and Brits catch the flu." "Canadians can only pray their economy won't be collateral damage," writes John Ibbitson in Canada's Globe and Mail. "Anything that drags down the American economy drags the Canadian economy down with it." And this could be another reason why the United States has shutdown crises and other countries don't - because the United States can afford to. At least up until now, the American economy has been able to continue to grind along despite shutdown disruptions that would stagger other nations. "Constant-shutdown, permanent-emergency governance is so destructive that no other serious country engages in or could tolerate it," James Fallows writes in the Atlantic. "The United States can afford it only because we are - still - so rich, with so much margin for waste and error."